$35, Full day; $25, Half day Great Package discounts for more frequent use! All Full-day & Half-day Packages (except Monthly) may be split between family dogs. All Monthly packages begin on the first weekday of the month and end on the last weekday. Pro-ration given for Monthly packages purchased after the month has begun when added to a complete Monthly package for the following month. Monthly packages assume 21 weekdays per month, on average. Monthly Puppy Packages, which include potty training assistance, are for puppies under 6 months of age. Please Note: All packages are non-refundable after purchase and non-usable after expiration date. Dog Delivery offered on a limited basis for regular Dog DayCare customers (Coralville, Iowa City, North Liberty, and Tiffin). Add $2 to above fee if more than 5-mile radius. $5 fee for emergency delivery service (not planned at least 24 hours in advance); emergency delivery service may not always be available. All deliveries must be pre-planned and include an in-home meeting prior to first pick-up.Deliveries must be scheduled 24 hours in advance, minimum.Deliveries cancelled with less than 24 hours’ notice will be charged at regular delivery rate. No-Show Fee: Charged at daily rate for service reserved. Late Pick-Up: $4 per 15 min. if past regular closing time. At Just Dogs, canine behavior & development is our passion! We understand that appropriate socialization at various stages of a dog’s life is important. Interactions that are safe, supervised, & on neutral territory can be a key to better behavior & improved well-being. A general play day at JDPC includes 3-hour sessions in the morning and afternoon—in climate-controlled playrooms & outside fenced yards, like Rocco & Sweet Pea’s Grassland. In between play sessions is nap time, complete with a cold peanut butter Kong® (or other parent-approved treat)! All dogs have a kennel assigned to them, which is their “home base” for nap time or breaks. Many dogs love having a chance to socialize, from active players to wallflowers! While dog daycare is not right for every dog,* for many it is a welcome alternative to staying in the house, kennel, or yard all day! Obstacles like the tunnel are part of creating an enriched play environment. 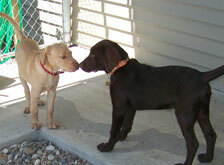 Puppies can learn so much about socialization at doggie daycare! *Doggie daycare is not for dogs who are aggressive or fearful of new dogs and/or humans, have health issues or physical limitations, or are advanced in age. Is Doggie Daycare Worth the Cost? Truth is, a daycare setting isn’t right for every dog. But for many, it’s a welcome alternative to being cooped up in the house, back yard, or kennel all day. Dogs are active and social animals—they need to run and romp regularly. And for most dogs, the chance to play with other dogs is a joy like no other. A neutral territory like daycare provides an ideal setting for this. Left home for extended periods of time, dogs often don’t get the physical exercise or mental activity they need on a daily basis. And busy owners can be just too dog-tired to give their dog enough exercise and play regularly. After a day at playcare, expect your pooch to be the one who’s more dog-tired than you. Destructive behavior, incessant barking, regression in housebreaking—these can be indications of dog who is lonely or bored. A safe, educational, and fun daycare environment can address these and other concerns. Animal experts agree that socialization of dogs is a key to their well-being. 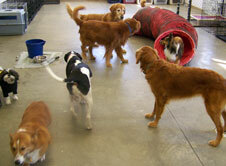 A daycare is a great place for your dog to make new friends—of the canine and human persuasion! Work on good manners: walking nicely on lead, not bolting through doorways, & waiting patiently in a kennel for their turn at playtime. Who Will Be Taking Care of My Dog? Dogs are creatures of habit; they like familiar, friendly faces—dog or human. That’s why your dog will be supervised at all times by the same qualified Dog Handlers who are dedicated to giving your best friend a terrific experience—whether for one visit or many. JDPC Dog Handlers go through several weeks of intensive training to learn about animal behavior and dog communication. They are taught to constantly walk around & observe and interact with dogs, with a focus on keeping play nice and safe. Our Dog Handlers also adhere to strict standards with daily sanitizing, ensuring a healthy place for your dog to stay. JDPC employees are also involved in ongoing pet first aid training. While we love and understand dogs, we are not veterinarians. 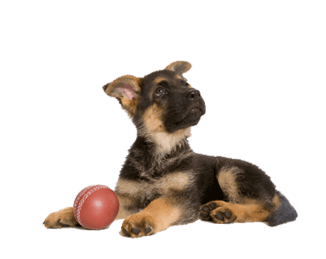 * Our passion lies in canine behavior and development. Just Dogs PlayCare focuses on health maintenance and disease prevention by keeping dogs active. Our goals are to play with and train dogs; teach pack socialization; address regular health concerns; understand dogs’ minds, hearts, and behaviors; and give them love, work, and purpose. * If an injury or illness would occur while your dog is at JDPC, we would typically use your own vet (if in Iowa City, Coralville, North Liberty, or Tiffin). After hours, we use Bright Eyes & Bushy Tails Emergency Clinic. Feel free to ask more about this during your pet’s intake meeting.